Release day is upon us! 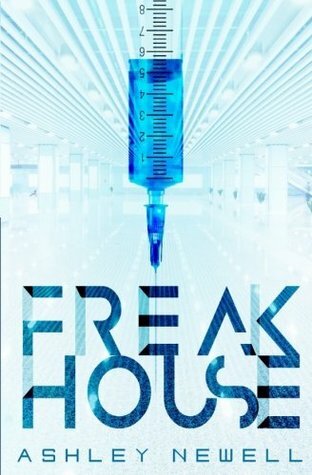 ​Freakhouse is live and ready to go! Thank you to everyone who has shown interest. You won't be disappointed with the 2nd edition. It's like the 1st edition, only prettier! So for those of you wanting to see Freakhouse in your own hands, remember that ordering online is just one option. Both Galen and Freakhouse are registered for library and bookstore distribution, so if you are willing to wait just a little longer, go to your local library or nearest bookshop and ask them to order in a copy for you. The more you ask, the more will be available! And remember, there are 25 giveaway copies floating around as well. I'm sure there's one or two of those that would gladly be loaned to someone else. If you stumble across a copy on your travels and want to know if it was an advanced copy or not, just look at the print date. All books are made to order, so only the giveaways were made prior to today, August 26th, 2016! So happy reading to all, and remember, a short review never hurt! The last Golden Ticket has been found! And by that I mean that the last of the giveaways have been won. Top Left: USA; Top Right: Canada; Middle Left: UK/Ireland; Middle Right: Australia/New Zealand; Bottom Left: "Everyone Else! "; and Bottom Left was the whole world together. Look at that, USA. You nearly beat the whole world. I don't think that surprises anyone. All of the books are shipped, have a shipping order ready for Monday's mail, or are safely in the hands of their new readers. So far only one book was unable to complete it's intended journey, but thankfully my printers covered the cost of returning the book safely to me. It was a bit of a pickle since they aren't allowed to store copies, so "return to sender" really meant that the book would be lost forever. Luckily we caught it right away. I'll see to it that it finds a good, loving home! ...just "No". Please just "No". I mean, you can spend $300 however you want, but since I wrote it, I'd rather you give me at lease a portion of what was probably a giveaway from 2013. (This has totally been listed since my 1st edition Freakhouse giveaway so I promise you that this isn't even the cover of the book he has.) Is it sad that I probably spent $20 to have him make $300? So, again, please, just "No". Besides, Freakhouse will be released on August 26th for a much more reasonable price. And then I can make like, maybe $2.00! Don't forget, e-books are also available on Kindle and Kobo, also for much more reasonable prices. ...and by that I mean "tomorrow"
So remember yesterday when I was talking numbers and said "before Friday"? Well, I wasn't wrong, but I didn't expect to reach those targets so soon. That's US on the left, Canada on the right. As of 11am this morning. Should I be more optimistic and go for a big number this time? Let's say 400 and 200 before Friday! Why not! This has been incredible! The global interest for Freakhouse has been wonderful to see. Already over 1000 people have added it to their to-read shelves, and well-over 1000 people turned out for the giveaways so far. And this time I can say "yay, Ireland!". Despite the majority of entries being from the UK, one book is flying overhead to Ireland as we speak. County of Mayo to be specific. Land of my husband's people, so that was a neat surprise. This is why the giveaways are random. Clearly I'd have favourites! So on we go for the last leg of this promotion. The US's numbers are steadily rising. I imagine that we'll break 300 from them before Friday. And the my humble home country is working its way up to 150. We'll see what happens on Friday when Freakhouse gets closer to the front page! Giveaway ends August 12, 2016.